Two Wheeled Inspiration – Where wheels and words come together. Riding from our house in Arvada, Colorado to the Rampart Range located in the Pike-San Isabel Forest just southwest of Castle Rock was one of longest distances I’ve ridden on my little Yamaha XT-250, AKA Dory. The round trip (including the trails we rode) was approximately 120 miles. After some discussion, Motoman and I decided to ride there because of the diversity of trails in the system and unlikelihood for mud. It had snowed a couple of days before and we were hopeful that it would not be muddy. It turns out that the OHV trails at Rampart Range are very similar to the mountain bike trails at Buffalo Creek in that they are covered with granite pebbles and sand, which tends to keep the mud to a minimum. When we arrived at the Rampart Range Staging parking lot, I was surprised at how many vehicles were in the lot. I became nervous about how many other riders I would encounter along a trail and how I would maneuver my motorcycle to share the trail. Mountain bikes are so much lighter! When Motoman asked me which trail I wanted to ride first, I picked a beginner trail, of course! It was a twisty path through the forest with the occasional water puddle. The trail was fairly smooth and the most common obstacle was tree roots, which are slippery when wet. It was an uneventful ride until we came to a 40 foot section of rocks on a downhill where I completely lost control of the motorcycle. I had stood up for the descent and when I reached for the rear brake with my right toes, all I got was air. I bounced down the trail, afraid to touch the front break for fear I’d go over the bars. I had a death grip on the clutch and bars. By the time I thought to release the clutch to slow down, I was at the bottom of the hill and came to an easy stop. I don’t know how I didn’t crash. We encountered only two other riders on this trail, despite that full parking lot. The next trail we did was still relatively smooth, but much muddier and hence slipperier. The climbs and the descents were also steeper. We found a beautiful rock formation and stopped for a snack and pictures. On this trail, we encountered only two other riders. Long ago when I met Motoman ~ circa 1997 ~ he was riding a crotch rocket style motorcycle. He was into big adventures. Our weekends consisted of rock climbing in the mornings and jet skiing in the afternoons. Mountain biking was thrown into the mix between all the other fun activities. A few years later, along came Sierra and farewell went that motorcycle. He lasted about ten years without a motorcycle. When he got back on the motorcycle, his focus turned to dual-sport riding with the kind of motorcycle built for riding on roads and dirt alike. His adventures became more exciting as he traveled to far away places. Sierra and I would look and listen with awe at his pictures and stories. It wasn’t long before Sierra presented us with half the money necessary to purchase her own motorcycle. Together they rode off and returned with beautiful pictures taken from mountaintops across Colorado and memories that will last a lifetime. 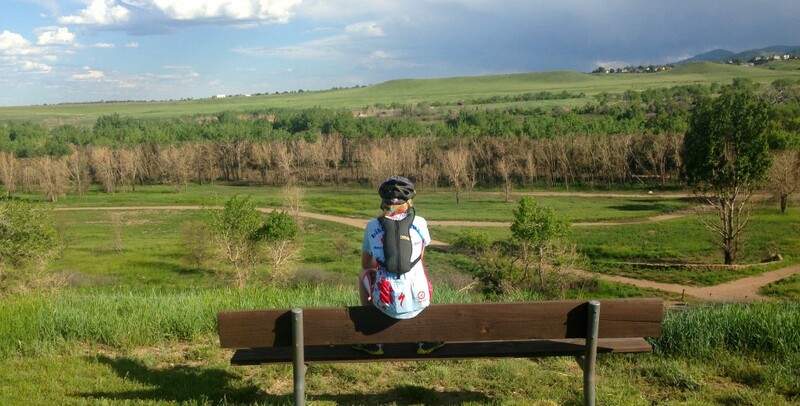 I came to realize it would be impossible to visit many of these places on my mountain bike; and, more importantly, that I was missing out on some fantastically adventurous family time. This became particularly evident on a family trip to Lake City, Colorado. After returning home from Lake City, the search began for a dual-sport style motorcycle that would fit under my short legs. The choices were few and far between. To top it off, I wasn’t willing to pay for a new motorcycle that I knew would likely take a beating as I learned how to trail ride. We finally got a phone call in May of 2016 that a motorcycle had arrived at Motorado that just might work. I quickly snatched it up since there weren’t any others to choose from. I’m pleased to introduce Dory aka Little Bluey. You can find her in the picture below. Since I started this blog back in 2014, the posts have been about bike rides, bike races, bike gear, and lessons learned from the saddle. That’s going to change. I’ll continue riding and writing as inspiration comes. However, the stories will now include experiences from a motorcycle saddle. I hope you’ll keep reading and find yourself some inspiration. As I drove up Highway 72 to Nederland, I wondered just what the course for this inaugural Nederland Cyclocross race would be like. The race flyer stated that the race course would wind through the heart of the town and include a mix of cyclocross features. What exactly, did that description mean? As visions or stairs and other urban cross features floated through my head, I parked and made my way to the registration tent. The first feature I noticed was a very sharp, uphill turn onto a covered pedestrian bridge over a creek. After retrieving my race number, I walked a bit more of the course. I noticed another bridge and some railroad tie barriers. I made some smalltalk with a woman nearby. The topic of conversation quickly came around to the race course. She mentioned on the other side of the course, that if you didn’t take the right line in one section, you were sure to end up in the lake. At that point I decided it was in my best interest to get my bike out of the car and take a pre-ride of the course. I didn’t mind getting dirty, but I certainly did not want to land in a lake astride my bike. Once the current race was over, I pedaled on to the course. I ended up behind another guy who must have already raced, because as we rode along, he told me about what was coming up around each bend. In this section of the course that wound along the creek, the vegetation was so tall that you couldn’t see what was coming until you were there. The first surprise was a sharp left turn. The next surprise was a path of beaten down cat tails. The mud below the cat tails was now being churned up by all the bike tires. At the end of the cat tails was a steep run-up. The next part of the course was the hard part: two- three off-camber ups and downs on loose dirt, and the steepest, loosest run-up ever. This was followed by the steepest, loosest descent ever seen (by me!) on a cyclocross race course. It was during this descent that I came upon the place where landing in the lake was supposedly a certainty if one were to take the wrong line. My conclusion was that landing in the lake was only a remote possibility under the worst set of circumstances. At the end of the lap, I began to question whether this race was something I could actually finish, let alone be competitive in. I’d been nursing a sore shoulder all week and it would be impossible for me to shoulder the bike in any of the sections where it would make sense to do so. I’d have to run the bike and lift it over the barriers when necessary. I considered packing my bike in the car and going home right then and there. Then my phone rang and Motoman wanted to know if it was raining in Nederland? I looked up at the threatening skies and thought how miserable this course would become if the skies were to let go. When Motoman arrived, I mentioned how hard the course was and that I was contemplating leaving. His response was that it would be just as hard for everyone else as it would be for me. As I pinned the number to my jersey, I thought to myself that I’ll just ride it; then I won’t have any expectations nor disappointment about how I finish. Then we got a FaceTime call from our daughter who we hadn’t spoken to in a couple of days. It proved to be the perfect distraction. When we hung up, I had only about 30 minutes before the start time to pedal around and half-heartedly warm-up. Besides, who needs to warm-up for ride?? Promptly at 5:10 PM, the race started and we were off! Racers were still rather clumped together when I reached the hard part of the course. A crash in front of me forced me off the bike and to run more of the off-camber section than I would have liked. However, as I trotted along, I realized that the women who were riding weren’t going any faster than I was. I had started to run with my bike because I didn’t want to stop. But now that I couldn’t find a decent place to remount, I just kept going. Two thoughts occurred to me as I finished that first lap 1) I did not want to run as much on the next lap and 2) this race was as hard for the other women as it was for me! I dug in and settled into a pace I could sustain for five more laps. I’m so proud to have finished such a difficult race! Taking 2nd place was the icing on the cake! While tasty, the six pack of beer only drowned my sorrows temporarily. That’s black bear fur stuck in the wheel. Arvada is a wonderful place to live. There isn’t much between my house and the foothills, although what’s there is gradually filling in with houses. I love the rural feel of this community. Seeing horses and other farm animals and wildlife on the way to the grocery store reminds me of my days back in Billings, Montana. Many of the streets in this area are still two lane country roads. All that quaintness gets tossed out the window, however, when you come to an intersection like Indiana & Leyden Road on any given school day at 7:10 AM. Those two lane roads can be backed up for nearly a mile in each direction as thousands of kids try to get to school at about the same time. Combine that volume of traffic with sun glare and distracted drivers and it amounts to a risk that I wasn’t willing to take on my bike. Like my daughter was counting down the days of school until she could sleep in, I was counting them down until I could ride to work! I was yelled at by a driver on Bike to Work day (June 27). He informed me that I should be riding on a bike path. When he finally took a breath, I interjected that I had every right to be on the road, to which he replied it was his right to run me over. I was buzzed by a Federal Express truck driver on Simms Street just south of Highway 128. I exchanged tweets with Fedex and like to think their drivers received a refresher on Colorado’s 3 foot law. It didn’t happen again and there are MANY Fedex trucks in the area since they have a distribution facility right along that stretch of road. I was honked at by a woman for taking the lane in order to avoid a three feet wide pothole in the road while descending at high speed. Surely, that’s not the case, right? Maybe those drivers are new to the area and are unaware of Colorado’s laws; we do have lots of transplants here. Here’s a little video that will help to educate you on the laws. Oh, and when in doubt, give a cyclist more room than you think they need. Sometimes we have to swerve, just like you do in your car. Drivers don’t like it when other cars get too close to them, either. Surely you can relate to that?